A simple Coquito recipe that’s festive and perfect for lifting your holiday spirits. A rich and creamy coconut eggnog spiked with white rum. When I first heard about this drink, I only had one question in mind. 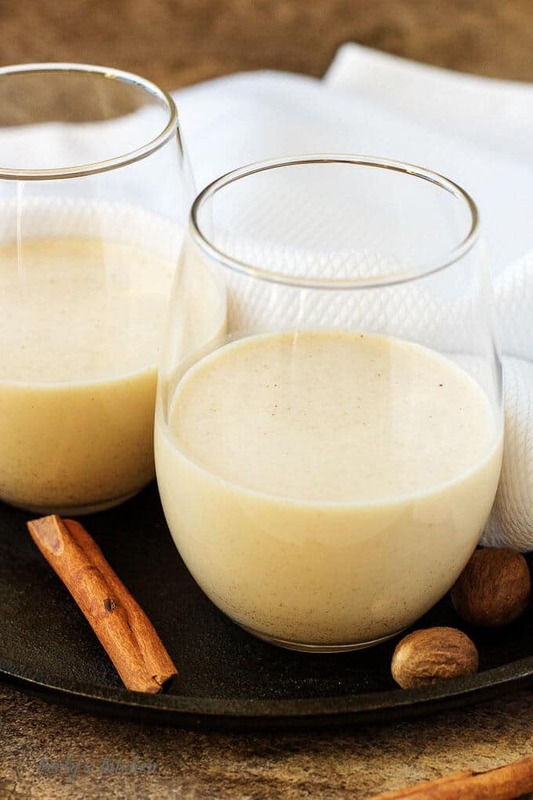 What’s the difference between a coquito recipe and a spiked eggnog? It turns out quite a bit. 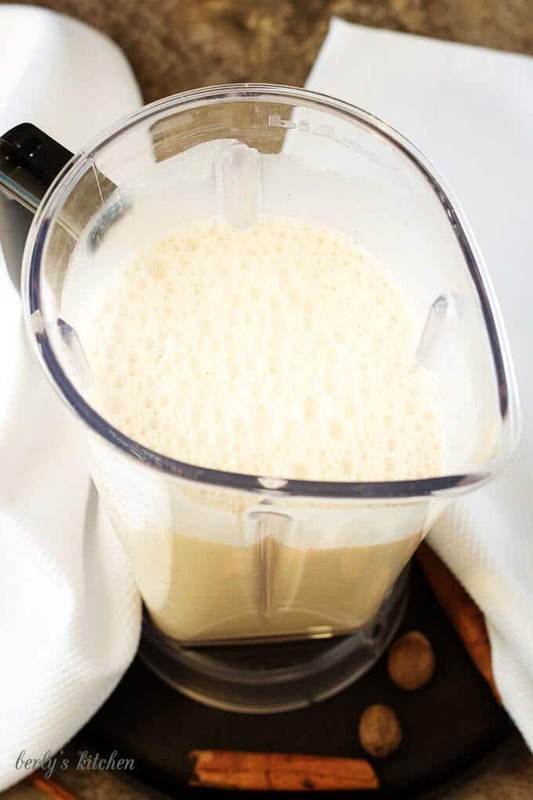 For starters, coquito has its roots in Puerto Rico and features coconut cream. Whereas, eggnog tends to use a dairy-based creamer. Additionally, a great coquito recipe features a high-quality Puerto Rican rum. While eggnog can be spiked with bourbons and whiskeys. In other words, what makes coquitos special is the use of island ingredients. Just take a look at the amazing combination of holiday and tropical ingredients in this coquito drink. It combines rich, decadent flavors like evaporated milk and coconut cream with earthy spices and smooth white rum. You can’t go wrong with this one. As you can tell, mixing this coquito recipe can be done in minutes. First, in a blender or large mixing bowl, combine the egg yolks, sweetened condensed milk, cream of coconut, condensed milk, coconut milk, vanilla extract, all the spices, and white rum. Next, blend the mixture for four to five minutes or until the drink is smooth and creamy. Then, chill the coquito in your fridge for about 30 minutes. Last, give it a quick stir before serving. Now, it’s true ours probably doesn’t qualify as a “traditional” Puerto Rican coquito recipe. However, it was given to us by Kim’s friend while living in Miami, Fl. I’m sure she’d agree it represents the traditional flavors quite well. 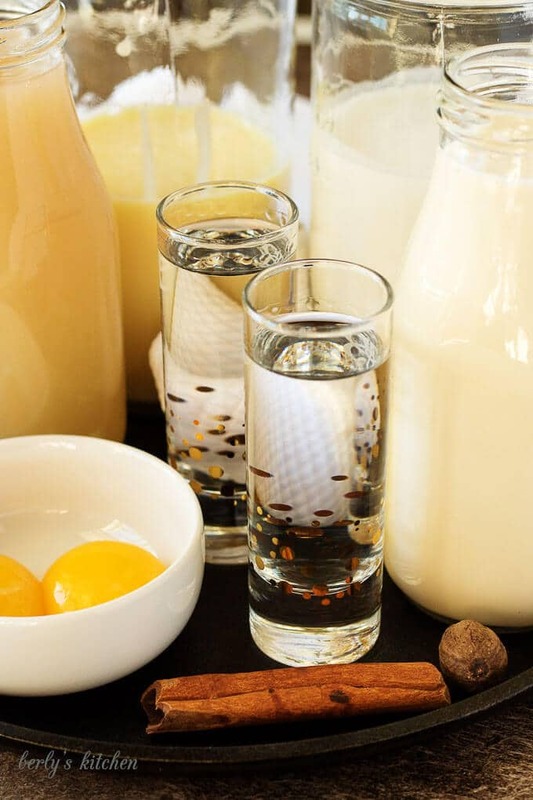 Here are a few tips to ensure your holiday coquito recipe turns out perfectly. Use a blender to mix the drink, it’s faster and easier to chill in the same container. 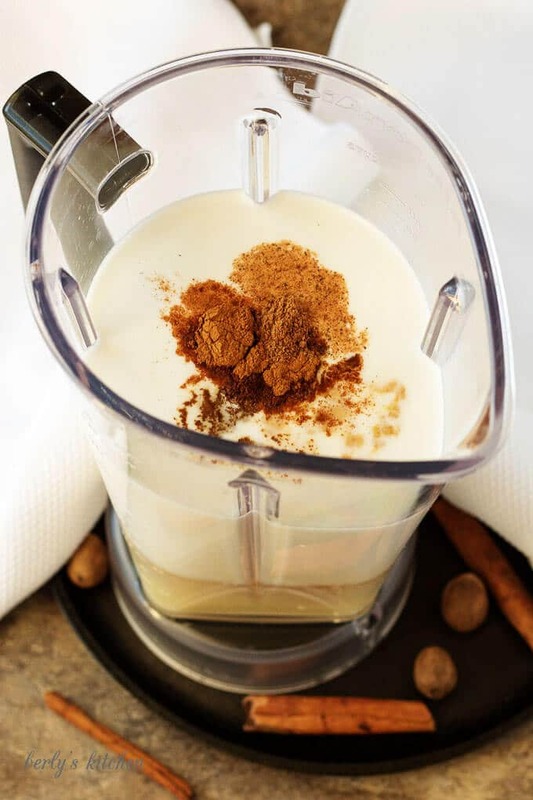 After chilling, make sure to stir the coquito before serving. The spices settle during the chilling process. Go easy on the nutmeg, especially if you’re using it as a garnish. Nutmeg is a powerful spice. Garnish the drink with whipped cream and cinnamon stick, trust me it’s yummy! A simple Coquito recipe that's festive and perfect for lifting your holiday spirits. A rich and creamy coconut eggnog spiked with white rum. First, in a large pot or straight into your blender combine the egg yolks, evaporated milk, cream of coconut, sweetened condensed milk, coconut milk, vanilla, cinnamon, clove, nutmeg, and white rum. Next, blend the mixture for 4 to 5 minutes until it is smooth and creamy. Then, chill and stir before serving. Last, it can be garnished with whipped cream, ground cinnamon, or cinnamon sticks. The calories listed are an approximation based on the ingredients and a four to six-ounce serving size. Actual calories will vary. The spices in the drink will settle as it chills, please give it a quick stir with a whisk before serving. Can be stored in the fridge for up to two days in a sealed container. This sounds very yummy indeed! Do you think this would work without the condensed milk? I am trying to keep my sugar intake low… Love the idea of the coconut mixed with wintery spices- and a healthy dose of rum! Thank you for your comments, Katrin! Hmm, well, I am sure you can make it without sweetened condensed milk; however, I am not sure whether or not it will effect the texture of the drink. With that being said, there are some substitutes for the ingredient available. I checked Google and quite a few options showed up. By making the sweetened condensed milk substitute, you can control the amount and type of sweetener used. (i.e. unrefined sugar, honey, agave, etc.) I hope this suggestion helps. If you decide to make it without the sweetened condensed milk, please let us know how it turns out 🙂 I would love to know! Not a big fan of condensed milk, but does look delicious. Thank you, Neh! It was really good. I loved the coconut twist to eggnog. Coquito is so good! I have a lot of Puerto Rican friends that make this every year. Thank you for sharing. Happy Holidays! Thank you, Zach and Happy Holidays to you as well. This was the first time we had ever been exposed to coquito. Apparently, we had been missing out for years lol! Sounds and looks delicious! Like a twist on classic eggnog! Looks perfect for a holiday party. Thanks, Michelle! We loved it, it was so perfect for these “cold” Florida winters lol! Coconut eggnog sounds delicious. Adding rum to eggnog…well how can you not!! Happy Holidays!! Thanks, Chelsea! We are thrilled you like the coquito! I don’t think I have ever actually had one of these before, but it looks delicious! Thank you, Rachel! It’s perfect for those “harsh” FL winters lol! Ooooh this sounds absolutely fantastic! I need to try this recipe out over the holiday season. Wishing you all the best for the festives, and for 2017 when it comes! Wow. This sounds really good. I’d love to try this one. Yum!! You can omit the eggs. I’ve Hispanic friends that do with and without especially if they have relatives with egg allergies. I gather it just won’t be as creamy. I always end up buying this but now I can finally make it. Thanks. This sounds amazing! 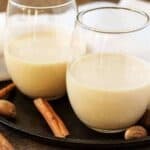 I would love to try it, I love eggnog so this is a fun alternative! Sounds delicious !! Definitely a fan of coconut milk , going to give this a try . LOVE coquito! Will be enjoying a few over the holidays and will have to give yours a try! Wow this drink sounds rich and creamy, this is definitely for special occasions! This looks simply amazing and perfect for the Holidays. Sounds amazing! I love coconut flavors and I’m sure it’s perfect in this! Thank you, Amy! Happy Holidays!! Such a fantastic twist on the traditional holiday eggnog. 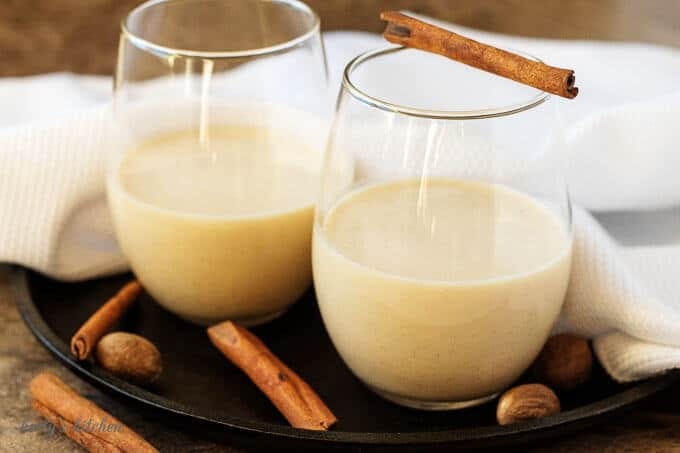 I have to admit that I really don’t do eggnog during the holidays; however, with all that coconut . . .well . . .let’s just say that I might make an exception for this divine beauty. Thank you, Lynn! We are glad you liked the recipe. The coconut is pretty tasty in this drink and the rum is nice after a long day of opening presents lol! A coconut eggnog!?!? That sounds delicious! Nice way to switch it up from the regular eggnog! This looks delicious! I can’t imagine it being hot and sunny for Christmas that must be so strange! Cheers!! I love to have a sip of this! Thank you, it’s a holiday treat, for sure!